Each day, young children in Aussie schools are going to school without lunch. Without this essential fuel, these kids find it extremely difficult to concentrate in classes, and their learning is compromised. Eat Up, primarily run by Lyndon Galea, is a not-for-profit organisation that, with the help of many generous volunteers, makes sandwiches and delivers them to these kids at their schools, where teachers will discreetly pass out the sandwich so there’s no embarrassment. Since starting in 2015, Eat Up has managed to make 250,000 sandwiches, and has spread from Victoria to NSW and Queensland as well. Apart from volunteers helping out, companies make a difference too. Coles Supermarkets provide the delicious Wonder White bread needed to make the sandwiches. Year 10 student Ruby Broomhall, pictured, is one of the organisers of Eat Up here at Woodleigh School. She has only begun having a major role in the program since the beginning of 2019, but has been helping out since the program started in early 2018. Since then, students have given up their lunch times to make sandwiches for Eat Up. 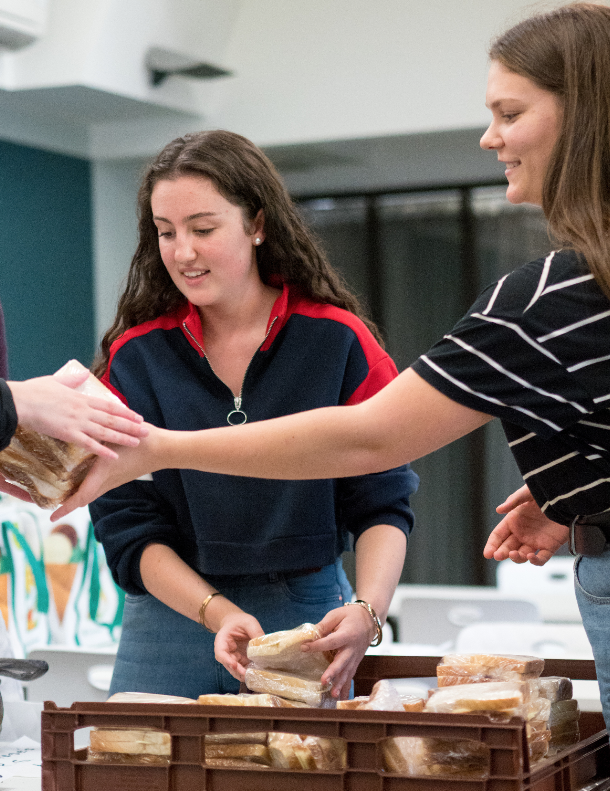 The first session brought 45 students making 700 sandwiches in the space of about half an hour. The number of students and sandwiches climbed and climbed throughout the year, and by the 12th session, Woodleigh had made a combined total of 10,000 sandwiches, getting more than 150 helpers, including students, staff and parents, and also helping out seven individual schools. It’s not just Woodleigh that is helping out this amazing organisation. Across the three states, companies such as Jetstar, RedBubble, PWC, and Swisse have contributed. Community centres around the country also host Eat Up sessions, where members of the public come along by themselves or with a team of family and friends to help make 5000 sandwiches in an hour. Schools like Ivanhoe Grammar, Ruyton Girls School, Carey Grammar, Caulfield Grammar and Geelong College have also made a huge difference. The organisation has even been featured on Sky News just last year. Eat Up has had major success over such a short time, but there is still so far to go. If you’re interested in making a contribution, consider attending a public sandwich-making event. Check out their Facebook @eatupaus to see upcoming events near you. Or, if you’d like to get your whole team involved, Eat Up can come into your workplace. They provide all ingredients and equipment; all they need is an hour or two and a bit of space. Simply visit their website at eatup.org.au to register. The same applies if you’d like to sign up your school — just head to the website.